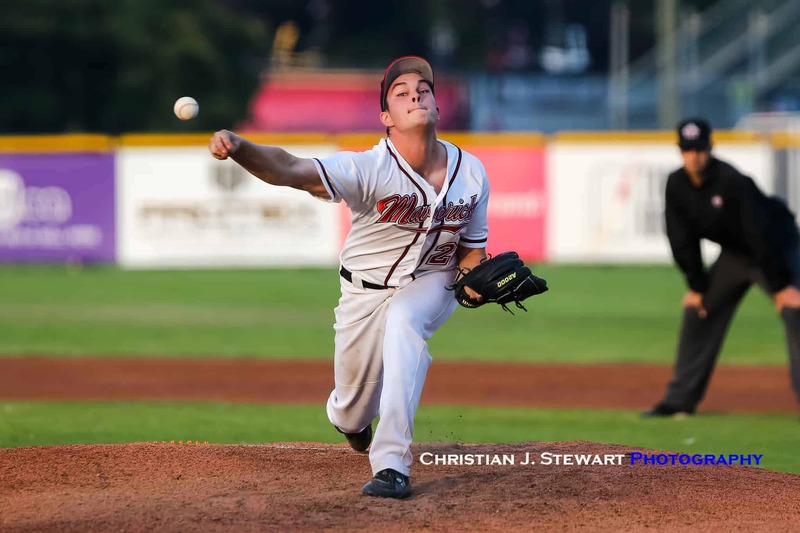 August 24, 2018, Victoria, BC – The Victoria Mavericks rallied from a 3-1 deficit with a trio of runs in the bottom of the fifth inning en route to a 5-3 win over the Sydney Sooners (Nova Scotia) Friday night at the 2018 Baseball Canada Men’s National Championship at Wilson’s Group Stadium at Royal Athletic Park in Victoria. The win keeps the now 1-2 Mavericks playoff hopes alive in Pool A and drops the Sooners to a similar 1-2 record, setting up critical games for both teams in their final round robin games on Saturday. The Mavericks will play Manitoba while the Sooners will face New Brunswick. Sydney took the lead in this one in the top of the third when a Mike Tobin sacrifice fly scored Josh Forrest for the first run of the game. 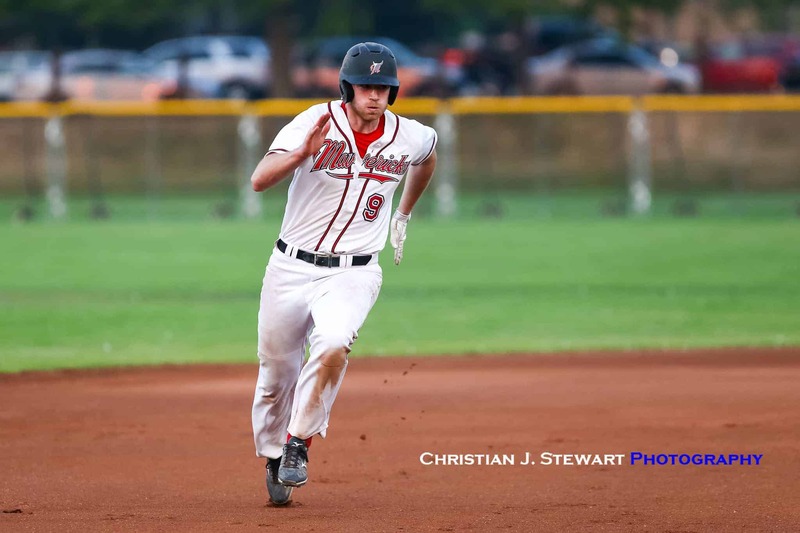 In the bottom of the fourth, Charlie Strandlund got the Mavericks back to even with an RBI double scoring Aidan Goodall who had reached earlier on fielder’s choice. Sydney took the lead back in the top of the fifth when a Colby Turple 2 RBI double scored Ken Long (single) and Mike Tobin (walk). That spelled the end of the night for Mavericks starter Brandon Chernoff, who was relieved by Dylan Thorp who got the Mavericks out of the inning with no further damage. 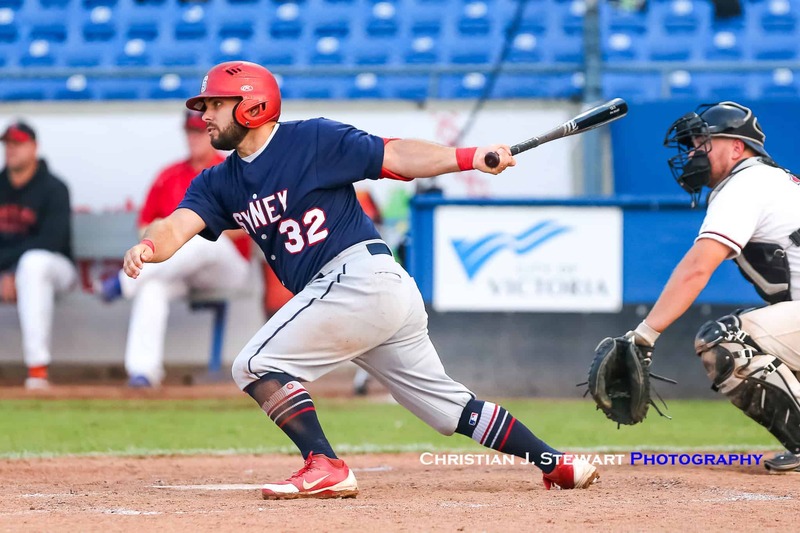 That seemed to spark the offence and in the bottom of the fifth, a leadoff error, walk and a single got things going and then a one-out single from Liam Goodall scored Kevin Pockett and Duncan Blades to tie the game. A wild pitch then scored Brady Rogers and the Mav’s had their first lead of the game. 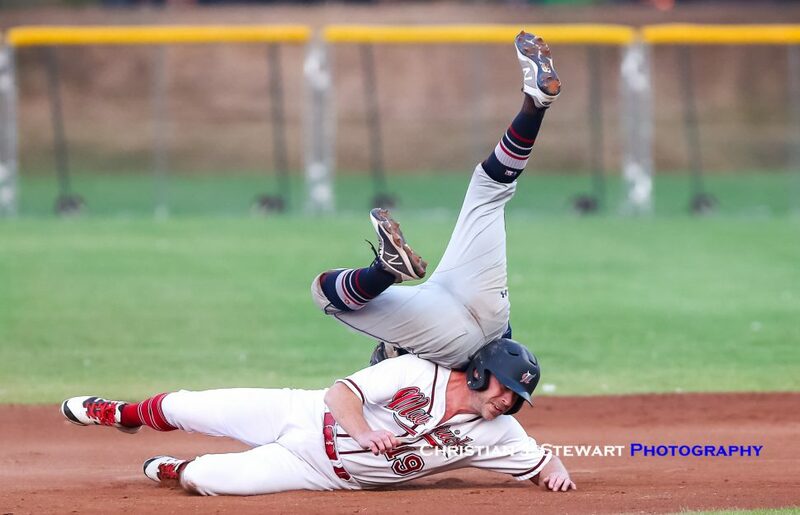 The Mavericks would score an insurance run in the bottom of the sixth and in the top of the seventh, Sydney would go down battling, getting runners to second and third, before Thorp got Jordan Shephard to fly out to end the game. Dylan Thorp was the winning pitcher for Victoria . He surrendered zero runs on zero hits over two and a third innings, striking out three. 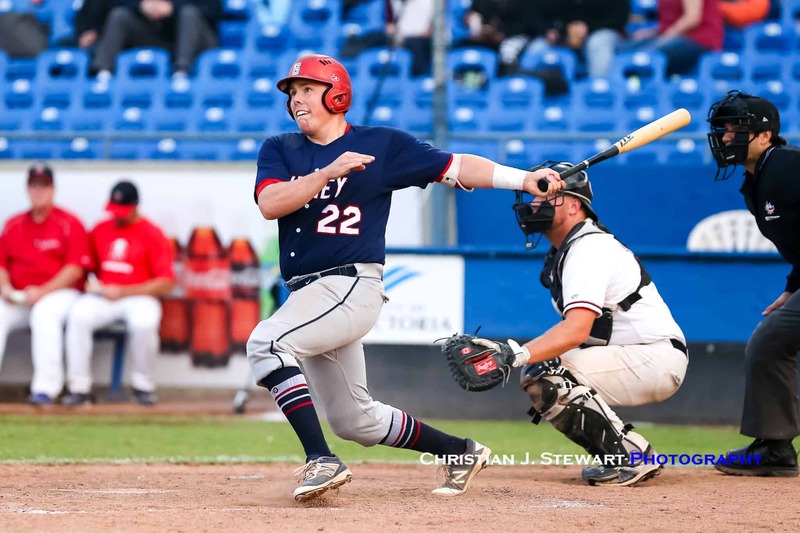 Brandon Chernoff started the game for Victoria and lasted four and two-thirds innings, allowing four hits and three runs. Jordan Pelham took the loss for Nova Scotia. He surrendered five runs on seven hits over six innings, striking out three. 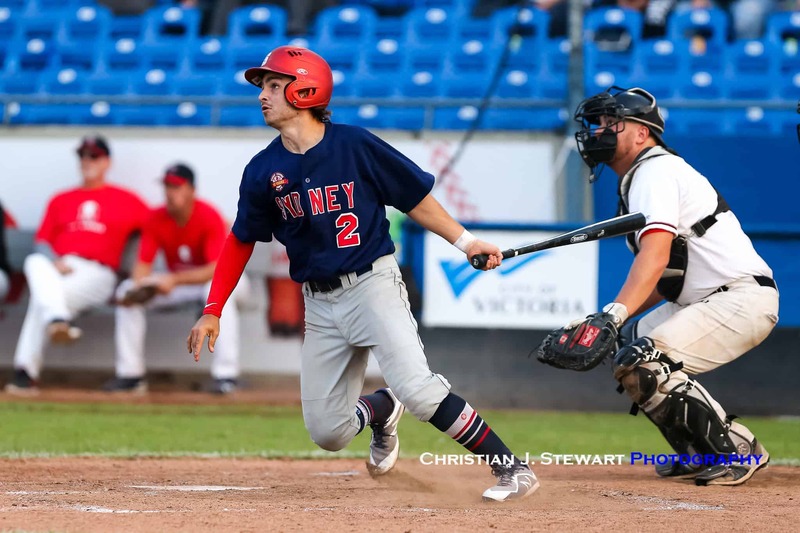 Offensively for Victoria, Duncan Blades, Strandlund and Justin Clarkson all doubled, while Blades and Aiden Goodall both had two-hit games. The Mavericks will look to keep their playoff hopes alive now when they face Manitoba at 2:00 pm Saturday at Wilson’s Group stadium. In the 6:00 pm game at Lambrick Park Friday night, Tecumseh (Ontario 1) punched their ticket to Sunday’s semi-final, running their record to 3-0 with a 2-1 win over New Brunswick. The Thunder clinch first in Pool A with the win, no matter what happens in their final round robin game with Manitoba on Saturday. 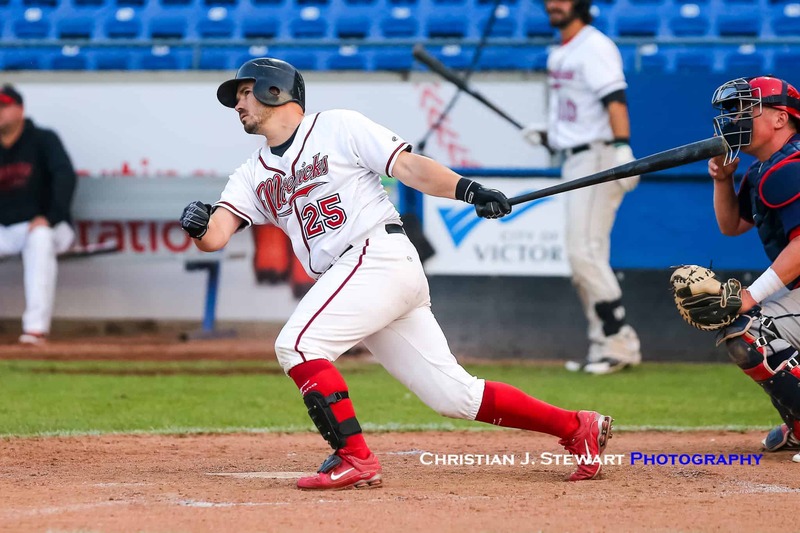 Friday’s hero was chucker Chris Horvath who threw a complete game two-hitter against a New Brunswik team that a night earlier, pounded out 20 hits and six home runs in a 15-1 thumping of host Victoria.